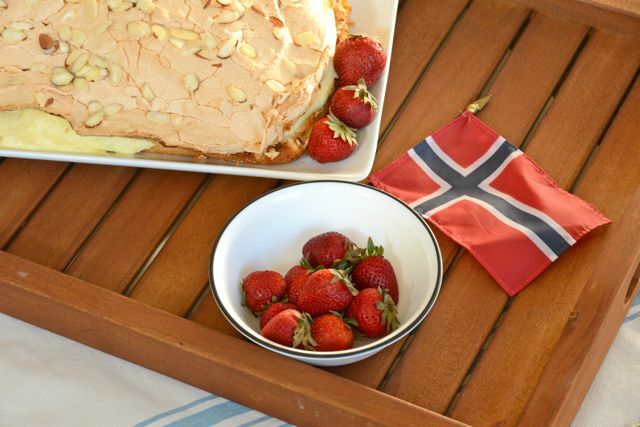 Wherever you are celebrating Syttende Mai, I wish you a great day. To mark the occasion, I baked you a cake. It’s called Verdens Beste, or World’s Best, which may seem like quite a claim unless you’ve tasted it. With a foundation of cake and a topping of meringue, and filled with creamy custard, it’s like a cross between a sheet cake, layer cake, and meringue all in one. Originating from the northern Norwegian town of Kvæfjord, it’s also known as Kvæfjordkake. Despite its plain appearance (nothing that a few vibrant strawberries can’t liven up), it’s a cake worthy of a celebration. Enjoy! Start by making the custard, as it will need to cool while you work on the other steps. Bring the milk to a boil in a heavy saucepan, then remove from heat. Beat eggs, sugar, and vanilla sugar in a bowl until they become light and fluffy and start to thicken. Gradually add the milk, pouring in just a little at a time to temper the eggs, and mix well before adding a little more. Do this until all the milk is added (take care to not use too fast of a speed so that the mixture becomes frothy; if it does, you’ll just want to use a larger saucepan for the next step and patiently stir until the custard forms). Pour the mixture back into the saucepan. In a small bowl, mix the potato starch flour with a little bit of water until it dissolves. Heat the egg mixture over medium heat, stirring constantly, and slowly pour the potato starch flour in. Stir until the custard thickens, taking care to not let it come to a boil. Transfer the custard to another container and chill. Preheat oven to 355 degrees and prepare an 8-by-12-inch pan by lining it with parchment and greasing it. To make the bottom cake layer, cream butter and sugar together until light and fluffy, then start adding the egg yolks, one at a time, until well mixed. Sift together flour and baking powder, and begin to add it to the batter a little at a time, alternating with the milk. Spread this batter in the bottom of the pan, using a spatula to evenly cover the bottom of the pan and create a smooth surface. Prepare the meringue topping by beating the egg whites until stiff then gradually adding the sugar and beating until stiff and glossy. Turn the meringue out onto the first layer and spread it around evenly, using a spatula to create a smooth surface. Sprinkle the almonds over the top, and then bake until golden, 30 to 35 minutes. Check the cake beforehand and rotate if needed to create a consistent topping. Remove from oven and let cool. While the cake is cooling, prepare the filling. Whip the cream until firm, and then fold into the chilled custard until incorporated. Remove the cake from the pan and slice in half horizontally so that you have two layers. Carefully remove the top layer and set aside; the meringue will crack easily, so slide your hands under it and transfer it as carefully as possible. A little cracking is okay, but do take care. Transfer the bottom layer to your cake tray and then spread the filling over it. Replace the top layer, giving it the same care as when you removed it. Refrigerate until you’re ready to serve the cake. Serve with any assortment of fresh berries. Serves a lot! You could probably serve as many as 12 people with this cake. Thanks for sharing-I own a Lefse Bakery and your post will be an addition to my web. Daytona, you do have the correct and official recipe now, with the correct instructions. Why not use it? You are right! Thank you for sharing it with me. 🙂 I have the recipe out my counter right now, actually, so I can make it later today. I’m excited to give it a try!